WASHINGTON — When some of President Donald Trump's top national security advisers gathered at the White House Tuesday night to talk about the surge of immigrants across the southern border, they discussed increasing the U.S. military's involvement in the border mission, including whether the military could be used to build tent city detention camps for migrants, according to three U.S. officials familiar with the conversations. The processing center will be similar to one currently used in McAllen, Texas, where children were kept in chain-link areas, which some called "cages," while the Trump administration's family separation policy was in effect last summer, according to two Customs and Border Protection officials. "I'm going to have to call up more military. Our military, don't forget, can't act like a military would act. Because if they got a little rough, everybody would go crazy. ... Our military can't act like they would normally act. ... They have all these horrible laws that the Democrats won't change. They will not change them." DHS did not immediately respond to a request for comment. 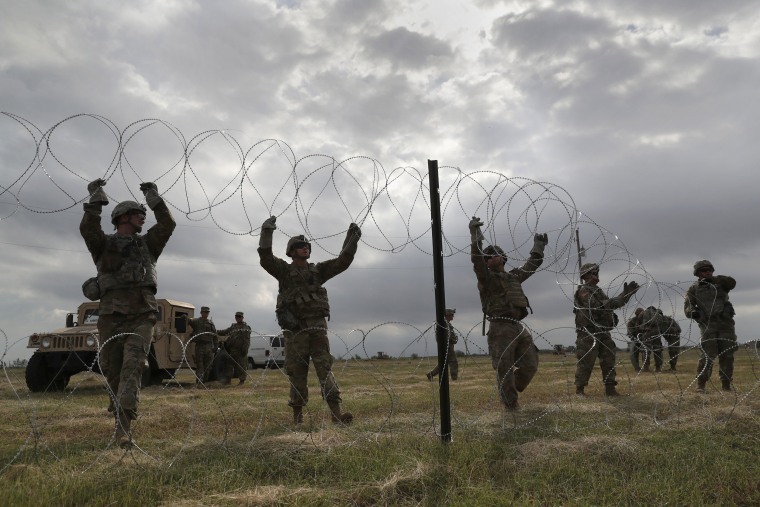 In a statement, Defense Department spokesperson Lt. Col. Jamie Davis, said: "As we said last year when we were looking at possible facilities at Fort Bliss and Goodfellow Air Force Base, DOD could be involved in the possible construction of facilities to house immigrants. There are currently no new requests for assistance." Stop kicking this can down the road! Terminate and defund ALL refugee, TPS and asylum policies! STOP FORCING U.S. TAXPAYERS TO PAY FOR THIS! YOU ARE AN IDIOT! WE OWE THESE FOREIGNERS NOTHING! TRUMP POLICY IS "AMERICANS AND ANGEL MOMS LAST"...YOU EXPLOITED US ALL! DO NOT EVEN THINK ABOUT ANOTHER RALLY! stoptheinvaders, MW and gabelle39 like this. CALL ON NATIONAL GUARD AND MILITARY TO DO WHAT??? HAND OUT DIAPERS! YOU ARE A FOOL AND A LOUD MOUTH TWEETING BAFOON! stoptheinvaders and MW like this. First of all - stop calling them migrants they are INVADERS. STOP TREATING THEM LIKE GUESTS!!! !